The animation and art communities will come together on October 21, 2017 to raise money for relief efforts underway along the Houston gulf coast. Producer Melinda Dilger and co-producer Linda Barry Esposito, Animation Director Majella Milne along with a diverse and talented group of colleagues and friends (aka “Team Texas” volunteers) are proud to announce Art for Texas, a benefit art auction, dedicated to supporting those affected by Hurricane Harvey. Proceeds from the event will go to Convoy of Hope, a non-profit organization providing emergency aid to storm survivors. The centerpiece of the evening will be a silent auction (that’s where YOU come in), featuring a wide range of art by top artists from California, Texas and across the country. More than 40 of the entertainment industry’s most influential animators and producers have signed up to contribute auction items and we’re hoping you will too! 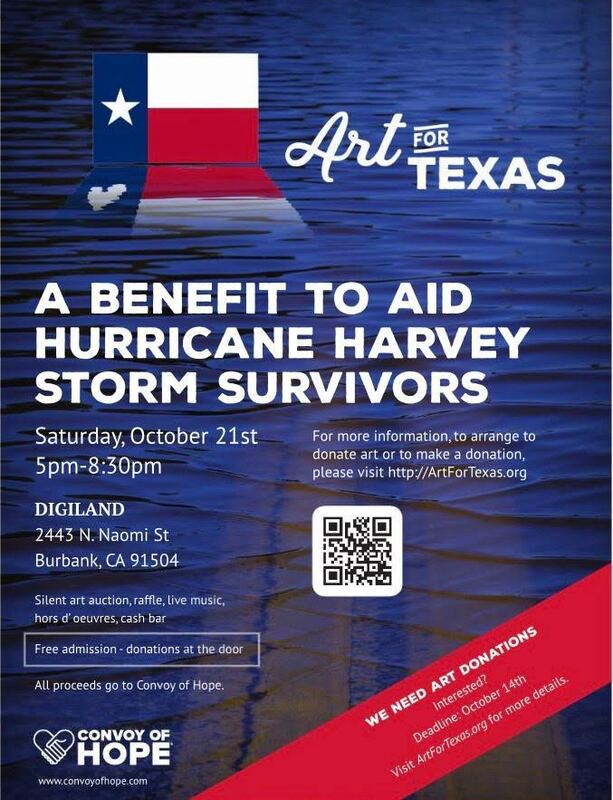 Artists wishing to donate auction items should contact artfortexas@aol.com. Submissions are due by October 14, 2017 and must be ready to display. This will be a silent auction where you, the Artist, will tell us what the minimum bid should be, based on fair market value. You will be provided a receipt for your generous contribution. Scheduled from 5:00 PM to 8:30 PM at the Digiland entertainment campus in Burbank, CA, the event promises to be a fabulous evening of live music and hors d’oeuvres, as well as an opportunity for guests to meet the artists. Light jazz will feature the vocal stylings of actress and entertainer Tomi Townsend. Free admission. Beer and wine will be available at a cash bar. Additional proceeds will be raised from the sale of raffle tickets on site for a variety of prizes. Curious George is the most popular monkey in the world. Since his introduction in the first publication in 1941, the beloved series has sold over 75 million books in more than 25 languages. MONKEY BUSINESS explores the lesser-known tale of George’s creators, Hans and Margret Rey. Originally from Hamburg, Germany, the Reys first met when Hans was dating Margret’s older sister. Years later, having heard that Hans was wasting his artistic talents as a bookkeeper in Rio, Margret traveled to Brazil to persuade him to marry her and do something creative together. After their four-week honeymoon to Paris turned into a four-year residency, they accidentally became children’s book authors when a publisher suggested they create a book out of a cartoon Hans had drawn. Being German Jews, however, their life in Paris abruptly came to an end in June 1940 when the Reys were forced to escape from the Nazis by riding makeshift bicycles-a manuscript of the first Curious George book was one of the few possessions they could smuggle out with them. Arriving in New York as refugees, they started their life anew and over the next three decades they created a classic that continues to touch the hearts and minds of children around the world. Cartoon Network Studios—home to beloved shows such as Adventure Time, The Amazing World of Gumball, Regular Show, Steven Universe, We Bare Bears, Clarence and more—is where the scheming, scribbling and real fun happens! We create original animated entertainment for Cartoon Network, the leading powerhouse in kid’s entertainment. Cartoon Network is part of Turner, a division of TimeWarner. Work closely with Line Producer to create day to day tracking schedule for production needs. Oversee schedule and manage artistic crew. Responsible for long-term and day-to-day running of the show’s schedule and all related paperwork. Responsible for disseminating schedule information to production personnel and tracking specific production tasks and relaying information to Line Producer. Track overseas production progress and compliance with scheduled delivery dates. Communicate closely with production and overseas studio. Minimum 2 years’ experience in animation production, animation technique, and management. Tech savvy a must! Proficiency with Microsoft Word, Excel, Outlook, Filemaker Pro is necessary. Organizational skills, flexibility, and ability to multi-task a must. Attention to detail, ability to work under pressure, a great attitude and overall enthusiasm. In a followup to the other day’s post, Adobe had a conversation with Kyle T. Webster on how exactly he recreated the Munch brushes. 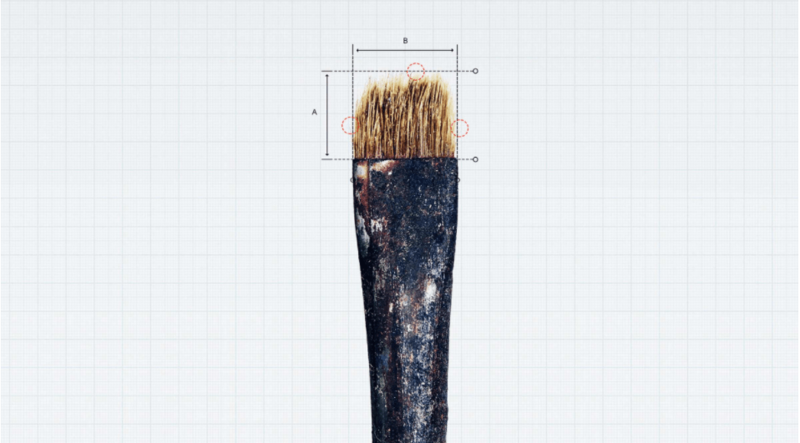 In a world-first collaboration, which we call The Hidden Treasures of Creativity, Adobe is working with the support of The Munch Museum in Oslo and award winning Photoshop brush maker Kyle T. Webster to digitally recreate seven of the more than 100-year old brushes used by Edvard Munch, painter of the famous artwork ‘The Scream’, in order to make them available in Creative Cloud for Photoshop and Sketch users worldwide. To give you a glimpse behind the scenes, we spoke with Kyle about his involvement in the project and how he was able to capture the exact detail of Munch’s brushes and recreate them in Photoshop and Sketch. WHAT: Extraordinary: Stan Lee is a highly-anticipated, star-studded live event paying homage to the world’s most iconic comic creator. The tribute, which is produced by In-Theater Live and Agents of Mayhem in partnership with Stan Lee Collectibles, will bring together heavyweights of the comic book world along with a number of leading TV/film talent. Presenters/Guests/Celebrity Attendees include: Tom Bergeron (Dancing with the Stars), Lou Ferrigno (The Incredible Hulk),Todd McFarlane (Spider-Man, Spawn), Michael Rooker (Marvel’s Guardians of the Galaxy, The Walking Dead), Andy Signore (ScreenJunkies and Honest Trailers), plus more to be announced. WHEN: The event begins at 6:00 pm. There will be a red carpet/arrivals line beforehand and those details are forthcoming. TICKETS: Tickets for Extraordinary: Stan Lee live at the Saban Theatre are currently on sale through Ticketmaster ranging from $95.00 for general seats to $350.00 for VIP seats and a meet-and-greet. Fans can visit Omaze.com for the chance to be flown out to Los Angeles, receive a complimentary hotel stay and enjoy two front-row seats at the tribute. The VIP experience includes a private meet-and-greet with Stan, and tickets to attend the exclusive VIP after party. Proceeds raised from the campaign will support Make-A-Wish® to grant life-changing wishes for children with critical illnesses. The ceremony will also be streamed live in movie theaters nationwide, allowing real-time access for fans outside of Los Angeles to share in the extraordinary experience. Full list and ticket info to be announced. ‘Nuff said! About Stan Lee: Known to millions as the man whose superheroes propelled Marvel to its preeminent position in the comic book industry, Stan’s co-creations include Spider-Man™, The Incredible Hulk™, X-Men™, The Fantastic Four™, Iron Man™ and hundreds of others. He introduced Spider-Man™ as a newspaper strip, which became the most successful of all syndicated adventure strips having appeared in more than 500 newspapers worldwide. Stan currently remains Chairman Emeritus of Marvel, as well as a member of the Editorial Board of Marvel Comics. About Omaze: Omaze is an online fundraising platform that makes giving fun and easy by offering once-in-a-lifetime experiences and exclusive merchandise in support of critical causes. Our campaigns connect influencers, nonprofits and donors to create lasting impact, and have raised funds and awareness for more than 200 charities with donations from over 175 countries. About Make-A-Wish: Make-A-Wish grants the wishes of children with life-threatening medical conditions to enrich the human experience with hope, strength and joy. According to a 2011 U.S. study of wish impact, most health professionals surveyed believe a wish-come-true has positive impacts on the health of children. Kids say wishes give them renewed strength to fight their illness, and their parents say these experiences help strengthen the entire family. Headquartered in Phoenix, Make-A-Wish is one of the world’s leading children’s charities, serving children in every community in the United States and its territories. With the help of generous donors and more than 33,000 volunteers, Make-A-Wish grants a wish somewhere in the country every 34 minutes. It has granted more than 285,000 wishes since its inception in 1980; more than 15,300 in 2016 alone. Visit Make-A-Wish at www.wish.org to learn more.